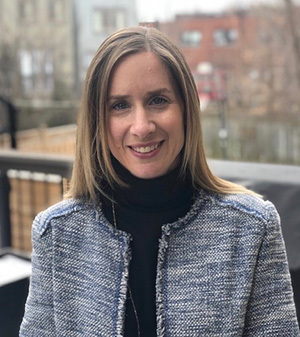 My name is Stacey Gitlin and I am truly honoured to be Toronto’s 2019 Gutsy Walk Honorary Chair. I was diagnosed with Crohn’s disease at the age of 20. For the first few years I had great difficulty gaining control over the disease. Between flare ups, medications, time spent in hospital, the challenge of living with a chronic illness was beginning to set in. Then in the Fall of 1999, while in hospital, my bowel perforated and I underwent emergency surgery. I now live with a permanent ileostomy. After my surgery, it was a time to reset, heal, and get back to living a full life. I was able to return to work as a teacher, get married, and have three beautiful children. My husband and I have participated in the Gutsy Walk since I was diagnosed and now we have the pleasure of walking with our children, our family and our friends. The Gutsy Walk provides us with an opportunity to give back, to share my story, and to come together as a community to raise awareness for inflammatory bowel disease. I am grateful to have the constant support from my family and friends. This support has allowed me to not only live my life to the best of my abilities but it has helped me share my story with others to help them navigate their way through this difficult disease. I am so excited to not only participate again in the Gutsy Walk but to be this years’ Toronto Honorary Chair. I look forward to sharing stories and walking together to find a cure on Sunday, June 2!